I attended Freeplay http://www.freeplay.net.au , the Australian independent games festival, on the weekend. It was great to see so many game developers come together in one place to talk about their industry. Freeplay is fairly focused on computer/ video game design, but there are a number of other types of games covered as well (such as pervasive and transmedia) as well as having a number of luminaries from other fields attend. 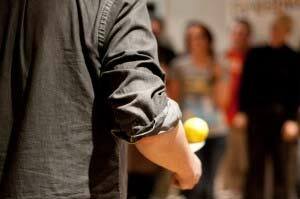 My freeplay experience started on the Thursday night as the umpire for the Lemon Jousting tournament, produced by the amazingly talented Leena van Deventer. Participants were met at the door of a bar down and alley, lead through the murky depths of the bar, out the back door, down a smaller, darker alley, up a set of old stairs, along a gang plank and through a massive metal door into the Lemon Jousting room. Just getting to the place was like an adventure in itself, the journey was a rabbit hole into the game, a tunnel that leads you away from the real world and lets you enter the parallel game world. Pocket Corpse was a great ice breaker. Most people came in pairs or threes, and might well have stayed that way all night. But this gave them the excuse and need to mingle and chat to other people. It meant that by the time it came to playing Lemon Jousting, they had already been in each other’s personal space, something that was about to come in handy. I only got to attend a few sessions at Freeplay on the weekend, but the talks I did see covered some really interesting topics. I attended Christy Dena’s How Every Little Decision Can Bring You Closer To or Further Away from Creating Art. All of the panellists were really interesting, but I was especially drawn to the work of Floyd Mueller who runs the Exertion Games Lab at RMIT http://exertiongameslab.org/ . They design and create games at the point where digital technology and intense physical effort intersect. Loving that! Floyd showed a couple of small videos and advised the crowd to build many, many prototypes to learn about the game you are constructing, which I think is really useful advice. Although Christy didn’t get a lot of time at the end of her panel to do her talk, the super short version she presented was a tantalising snippet of her research and I would love to hear more from her next time! One of the interesting things about Freeplay is the proliferation of technology. At any other event, when you seen people poking at their phones, you know it’s because they’re bored. At Freeplay it’s because they’re engaged and interested and sharing their thoughts on twitter. This was especially apparent in the Words We Use panel, where some inflamitory remarks were made by the chair and a couple of the panellists. Usually you might find disgruntled comments under a blog post a few days after the event, but at Freeplay you could watch the twitter stream and know what the audience were thinking straight away. They commented on the topics, on each other’s repsonces and carried on a converstation while listening to the panellists speak. It was a fascinating way to engage with the topics raised as they came. I also sat on a panel, the final one for the festival, called The Next 12 Months. 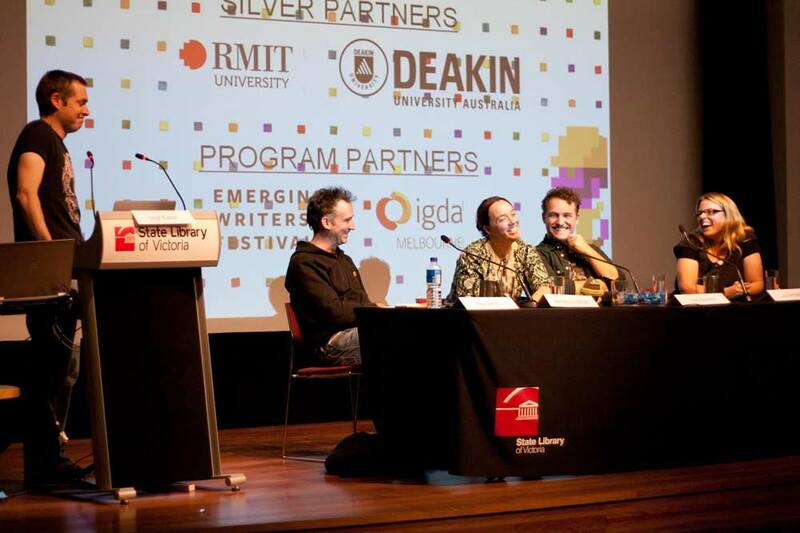 I was joined by Hugh Davies, the chair of Freeplay, Trent Kusters, founder of the development collective League of Geeks and Lisa Dempster, the Artistic Director of the Emerging Writers Festival. The panel was chaired by the charming Matt Ditton, convenor or the Games Design program at Griffith Uniersity. I was in some illustruious company! We all spoke about the future of gaming (obviously!) I was (and still am) all for taking games to the streets, going outside to play. Building games for out in the real world, which is my current focus. Building games for museums and galleries to engage with their visitors in a whole new level. Bring on the next 12 months!